Having just returned from sitting as a panelist at a grading examination and having instructed at the pre-shinsa seminar, I was asked for feedback by many of the unsuccessful candidates. Although this examination was for candidates from ikkyu to 4th dan, I realised that most people who failed did so for the same reasons. So having posted before on the things you need to do pass, this post is a simple guide to the 3 mistakes that will cause you to fail. You did not hit anyone – it is surprising how often candidates get to the end of their 2 minutes without having managed to make a successful strike. There are various reasons for this. In more senior shinsa it can be because both players have strong kamae and it is not possible to break through, but more often than not it is because people wait rather than seizing the initiative with seme. This can result in successive ai-uchi attacks where one person attacks every time their partner initiates their own attack. You did not lift your left hand up – people seem to confuse quick small attacks with a static left hand, causing the right hand to do all the work. Typically this makes it impossible to hit the top of your opponent’s men with sufficient sae to make a successful yuko datotsu. Too much right hand power also spoils your posture causing you to lean forward or leave your left hip and foot behind. You did not have sufficient weight on your left foot – this is related to the two earlier points, but you need to have enough weight on the ball of your left foot to push the right foot forward as soon as you see or make an opportunity, thereby being able to strike instantly without having to transfer weight from one foot to the other. Sometime back I wrote a post on how to train for grading examinations. Having sat on the 4th and 5th dan panel in Brussels last week and as I am scheduled to be an examiner for the Irish National Grading this coming week end, I thought it might be useful to highlight some of the points that the panel will be looking for on the day. 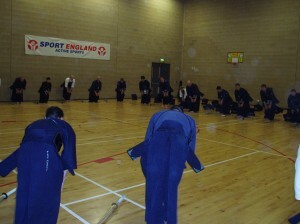 The purpose of the kendo grading examination is to allow you to demonstrate what you have learned and what you are capable of. It is unlikely that you will pull something out of the bag that you can not do in your normal keiko. You need to have put in the quantity and quality of practice since your last grading to justify promotion. There are some people that treat the shinsa like a lottery – turn up often enough and your number will eventually come up. The chances are if you are doing the same things you did the last time you failed, you will fail again. • Chakuso – clean unfaded hakama and keikogi. Hakama should be the right length, keikogi wrinkle free at the back. Bogu should be tied correctly with men himo of the correct length. Shinai should be in good condition with no protruding tsuru or nakayui and the tsuba should reach the bottom of the tsuka. • Entry and exit – make sure that you understand the pattern for entering and crossing the shinsajo operating at that grading. Either watch the people before you, or ask if you are in the first group. • Sonkyo – bow correctly and make a strong confident sonkyo with a straight back. If you have knee problems tell the organisers and make an alternative salutation. • Kamae – keep a strong kamae and make sure your left heel is off the ground. • Full spirit – give yourself time to settle and make a strong kiai. Attack at the right opportunity with full spirit. If your opponent counters or stops you with his shinai, do not let it break the force of your attack. Do not show emotion at, or acknowledge your opponents successful attack, just go on to take or make the opportunity for your own technique. • Correct posture – keep your posture straight, do not duck to avoid being hit. • Ki-ken-tai-ichi – remember that your hands and feet should work together. • Seme – take the centre befor you hit. If you can make your opponent move first and take debana waza, you should impress the panel. • Zanshin – show good zanshin, do not showboat. Ensure that you turn and go forward to the correct distance after each attack. • Most importantly – keep a clear mind and do not panic into attacking when there is no opportunity. I just got back from a weekend seminar and grading in Stoke on Trent. As an instructor and grading panellist it is interesting to see whether a hard day and a bit’s training and coaching before a grading examination makes any difference to the outcome. Like everything in Kendo, there is no easy answer. Certainly, if you have a major physical technique problem that is causing you to fail gradings then you can’t fix it in a few days. You need to train repeatedly until doing the movement correctly becomes instinctive. On the other hand small corrections to kamae and timing and the understanding of opportunity can be understood and acted on quickly. One candidate had some advice on changing his seme and went on to do a great job of passing 4th dan. Everything you learn at seminars or from visiting sensei is useful. The question is whether it is useful at the time you learn it. If you have a problem of hitting men correctly then the recipe for the perfect gyaku dou or kaeshi hikigote is not going to solve it. On the other hand memory is a wonderful thing, in that it files away information until you do need it. I occasionally have flashes of enlightenment about advice given to me 20 years ago when it made no sense at all. Now having learned some of the bits in between, I start to see the point. In terms of preparing for grading you need either your own game plan or a sensei that has one for you. I have to thank Yanai Norimitsu sensei, (now in New York) for making me practice only debana men twice a week for a year in the lead up to my passing 7th dan. Somone once said the more you do of what you do, the more you get of what you’ve got. So the rule is listen to advice, isolate the points that are holding you back and get help to fix them and practice until doing it right becomes second nature.